Four retirements during the 2012-2013 academic year marked the conclusion of long and dedicated careers for a quartet of faculty and staff members who served with distinction for a combined total of 96 years. The group includes the first female professor to retire from the Department of Veterinary Clinical Sciences, a veterinary technologist who started the same year the Veterinary Technology Program began, and two PVM alumni who worked in the field of diagnostic pathology for the Animal Disease Diagnostic Laboratory. 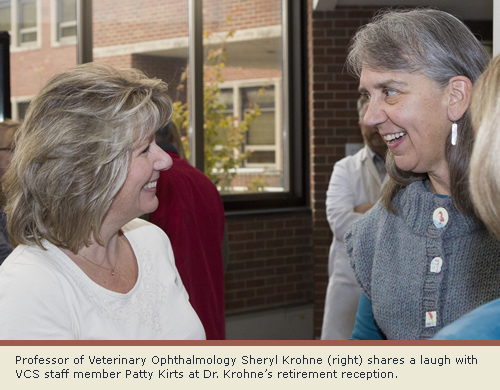 Professor of Veterinary Ophthalmology Sheryl Krohne (PU DVM ’83) retired effective December 31 from the Department of Veterinary Clinical Sciences, which honored her at a special reception as its first female faculty retiree. After earning her Purdue DVM degree in 1983, Dr. Krohne worked as an associate veterinarian in a private practice in Indianapolis for a year before returning to Purdue as a graduate student in what was then the Department of Small Animal Clinics. She earned her Master’s degree in 1988 and was appointed as an assistant professor in 1989. She became a Diplomate of the American College of Veterinary Ophthalmologists in 1991. During her career she authored more than 40 peer-reviewed manuscripts and nine book chapters, and pioneered the use of laser flaremetry as a groundbreaking technique for quantifying the degree of inflammation in the eye. Dr. Krohne also is a highly sought-after CE speaker and served as president of the American Society of Veterinary Ophthalmology. Dr. Duane Murphy (PU DVM ’84), veterinary pathologist and assistant director of the Animal Disease Diagnostic Laboratory’s Heeke Lab in southern Indiana, retired this spring after 19 years of service to the citizens of Indiana. The Heeke Lab is located at the Southern Indiana Purdue Agriculture Center (SIPAC) in Dubois, Ind. During his tenure, Dr. Murphy worked closely with veterinarians, the poultry industry, and animal owners to help solve disease problems. In his role as veterinary diagnostician for southern Indiana, he dealt with a breadth of diseases in a wide variety of species. As a result of his diligence, he saw and aided in the diagnosis of a number of disease outbreaks. While working to diagnose the cause of illness in a group of rabbits, Dr. Murphy recognized a possible outbreak of Rabbit Hemorrhagic Disease, a foreign animal disease which could have devastated wild rabbit populations. In concert with the Indiana Board of Animal Health and the USDA Area Veterinarian-in-Charge (AVIC), the diagnosis was confirmed, and the threat of an outbreak was eradicated before the disease could gain a foothold in the U.S. Following 17 years of helping animal owners in Indiana and from around the country, and teaching veterinary pathology to veterinary students, Dr. Christine Holland (PU DVM ’73), clinical assistant professor of comparative pathobiology and diagnostic pathologist with the Animal Disease Diagnostic Laboratory, retired at the end of December. A member of the Purdue DVM Class of 1973, Dr. Holland completed her Ph.D. in veterinary pathology in 1994 and began working at the ADDL as a diagnostic pathologist in 1995. She was appointed as a clinical assistant professor in the Department of Comparative Pathobiology in 2003.